Multipurpose makeup is perfect for quick summer beauty fixes, and it can help save much-needed space in your travel bag. Pick up these dual-use cosmetics to create a fun, breezy look anytime, anywhere. 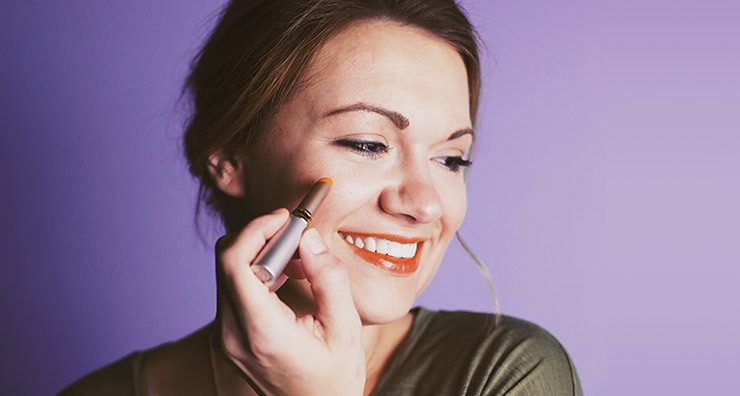 jane iredale LipDrink SPF 15 has several perks for your pout. This sheer, fresh citrus-scented treatment helps protect lips against harmful UVA and UVB rays while adding a glossy finish and color. Available in the shades buff, crush, flirt and sheer, it contains avocado and carrot seed oils to help soften and smooth lips and coffee seed, blackberry and green tea leaf extracts to shield against free radicals. Apply it over your favorite liner for evening or rock it alone for daytime. Did you know that most cheek and face powders can be used as an eyeshadow in a pinch? One of our favorite cheek formulas that transitions into a gorgeous eyeshadow quad is Glo Skin Beauty Shimmer Brick. This product comes in two different color palettes to complement a variety of skin tones. The shimmery minerals can be used to create an eye look with depth and dimension or as a highlighter in your strobed look. You can also use them to help sculpt and contour your features, making this an extra handy item for your makeup bag. jane iredale Just Kissed Cheek & Lip Stain is an easy way to achieve a quick pop of color on your lips or cheeks. The formula adjusts to your skin’s chemistry to flatter individual skin tone, so you’re sure to create a natural look whether you choose Forever Peach or Forever Pink. Its silky smooth texture helps to soften cheeks and lips without being sticky or greasy. Avocado butter, wild rose wax and olive butter help to nourish and protect against moisture loss. If you’re hooked on your separate products and want to keep a full arsenal of makeup on hand, jane iredale Starter Kit is your space-saving travel solution. This compact collection includes PurePressed Base, Amazing Base, Smooth Affair, POMMIST, application brush and travel-sized cosmetic case with a mirror. Available in five different shades to flatter each complexion, the products work together to create a smooth base to your skin. Just pack your favorite mascara and some shadow and you're all set. Do you have a question about multipurpose makeup? Let us know in the comments section.